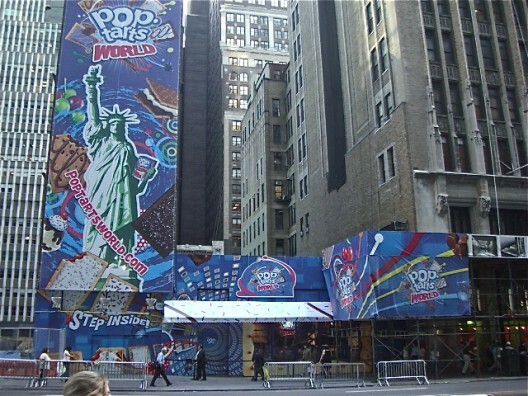 The Blog for Baby Boomers - TODAY'S SIGN OF THE IMPENDING APOCALYPSE: POP-TARTS WORLD OPENS IN TIMES SQUARE! TODAY'S SIGN OF THE IMPENDING APOCALYPSE: POP-TARTS WORLD OPENS IN TIMES SQUARE! Topping the list of attractions, certainly, is The Varietizer, where you can punch six flavor selections into a touch-screen console. A robot then pulls your treats from a column with its suction-cupped arm, and deposits them into a pile below. If you choose--and why not?--you can watch YouTube clips of ordinary folks playing with Pop-Tarts, or instead log onto Facebook to let your friends know where you are and what you're doing.